The Funky Felter: The popularity of felted wool beads and helpful hints on how to buy quality handmade wool beads . . . The popularity of felted wool beads and helpful hints on how to buy quality handmade wool beads . . .
Over the past few months I've seen a great increase in the popularity of felted wool beads. On Etsy and elsewhere, it seems that these little woolly creations have become quite the jewelry making and crafting necessity. My sales of woolly beads has increased dramatically, and I see that other Etsy sellers seem to be having a similar affect. Perhaps they are just a novelty to some, and they want to give them a try to see how they feel and will work in their own projects. For some jewelry makers, they are a unique, new alternative to other kinds of beads and blend well with many styles of jewelry making. Whatever the cause, there certainly is an increase in interest. To be completely honest, I didn't use to enjoy making the little pieces of fiber goodness, but now that I'm making a LOT more of them, it has become rather therapeutic. I also have taken much more pleasure in choosing the colors and experimenting with my felting technique for improving my wool beads. Overall, it seems, not only in there an increase in interest for the wool beads, but I personally have had an increase in my own interest in making them so it is a win win situation! 1. Do the beads appear to be uniformly round? If you are a jewelry maker, it is important that your beads are symmetrical in most cases. Lop-sided beads may not be deemed as quality and passed on by a customer. 2. Do the beads appear to be free of lumps, bumps, and dimples? Depending on the process used to felt the beads, some wool beads are just better quality than others in this respect. Sometimes it is a neat affect for a wool bead to have this characteristic, but if you are planning to use the beads for objects of resale, a customer may deem lumps, bumps, and dimples as a flaw, not as a desired attribute. It just depends on your personal target audience. These attributes can also signify that a bead has not been properly formed or felted fully which does affect quality directly. 3. Are the wool beads an appropriate size? When dealing with wet process of felt making, size can not always be determined due to the shrinkage that occurs. In my wool bead listing descriptions, I always state that bead size will vary from 0.25 inch - 1.5 inch so that my customers know that beads will be variable in size. If you are ordering a bulk of wool beads from someone (and yes, I do offer bulk ordering on all my beads! ), it is often times good to let the artist/crafter making your beads know what they'll be used for or any sizing requests. For instance, if you plan on making earring sets with your woolly beads, then just let the maker know that you'd like uniform pairs of beads. Overall your bead pair sizes may vary, but you'll hopefully end up with several sets of the same size and color to use. Also, needle felted beads usually can accommodate size requests more easily than the unpredictable nature of wet felting. 4. What felt making process was used to create the wool beads? Sometimes this really doesn't matter at all, but if you plan to cut into the bead or alter it other than poking a hole through it, then the durability of your bead is important. Durability and sturdiness of a felted wool bead is often times based on the felt making process used to create a bead. 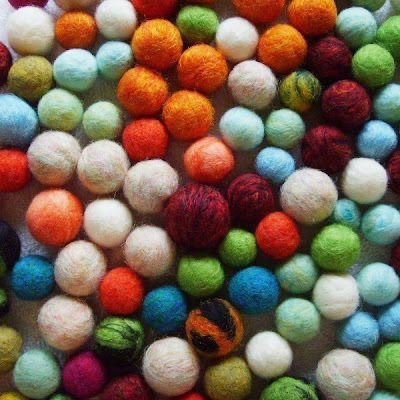 Wool beads or balls that are needle felted usually have a more uniform appearance in nature than a purely wet felted bead (except for the slight notice of the needle poked holes), but since they were not vigorously wet felted, they may not have as much durability in the long run. Wool beads or balls that are wet felted only can sometimes have a less uniform appearance than a needle felted bead, but often times, the fibers are more dense and matted due to the vigorous process of their creation. I personally use a combined technique for the best of both worlds. Needle felting allows for uniformity in size and shape, while wet felting increases the durability and density of a wool bead. When the processes are combined, it produces the best quality wool bead in my opinion. The handmade process is longer, but I believe it is worth the effort and little added expense to the buyer. Overall, I suggest that you buy what you prefer and what best fits your budget and project aspirations, whether needle felted, wet felted, or a combined technique. Most truly handmade wool beads are going to be of utmost quality due to the skill, time, and care of their maker! Happy hunting for some new woolly beads! I recommend that every jewelry maker, fiber artist, and crafter, try using them in a project at least once. They are really a unique, eye-catching addition to any project. You can find several options for wool beads in my Etsy shop as well as by searching Etsy and some of its other fabulous felters shops.